Its getting colder and colder here. Today the temperature here is 4F and I am frozen to my bones. I am knitting a lot these days but it looks like I can never get enough warm cloths for the season. A hot bowl of delicious food is all I crave for when I step in the house. I think a one pot dish like a spicy pongal with loads of vegetables in it, is a heavenly food in this season. Roast 1/2 tea spn cumin seeds, fenugreek seeds and powder them. Heat ghee and add mustard seeds, 1/2 tea spn cumin seeds. When they start popping, add turmeric, curry leaves, green chillies. Fry for min and add vegetables, rice, dal and fry for 3-4 mins.Â Add pepper, salt. Add the cumin-fenugreek powder. Pour in water(about 4 times rice). Sprinkle chopped coriander leaves. Cook in pressure cooker. Wow, the picture is so appealing. I too make it exactly the same way, except 3 portions of water and one portion of low fat milk. Heavenly meal on a cold day. Shilpa: Nirupama, cumin does not have any bitter taste. Methi in large quantities can make a dish bitter, but for this dish, only a little methi is used, so it is not bitter. By the way, does 4 times water make the pongal paste-y? Shilpa: J, this was derived from khara pongal recipe which requires 8 times water. I tried to make is less watery by reducing water amount. Unlike pulav, normally pongals are a bit pasty. I have never ever made pongal or tasted it ( although I am not sure of that maybe I have somewhere) but this recipe is so easy to follow i feel like trying it. Looks so yummy…will surely try it. I think it is pepper which is added instead of methi, when u make pongal. Shilpa: Aparna, this is a special version that I have learned, not the traditional one. Here is methi gives a very nice flavor. Shilpa, marvelous! It surely looks filling n tasty! One pot dish for week end! Tks for sharing, methi is good idea! Shilpa: Nirupama, could you tell me what was wrong? 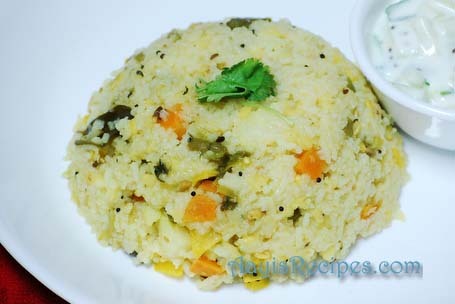 I also prepare similar vegetable pongal, but I don’t add fenugreek powder. Will try that the next time. Shilpa: This looks like a tempting heartwarming pongal for cold days for sure. I wonder how methi works in it though. Nirupama: if you did try please help Shilpa understand what dimension of flavor you did not like in it. So that she can put some updated notes from the learnings. Thats the least you can do. A prolific blogger like Shilpa would appreciate it. Do reply to her for the benefit of all the readers. Nirupama one more thing. It is better you don’t venture outside your tamil iyengars boundaries stay within them. What audacity ! to go to peoples blogs and be so nasty. You don’t even know what was terrible in that pongal ! Tells a lot about your cooking skills. Shilpa I tried ur simple egg cake for my hubby’s b’day and it was too good. i have put my cake’s pic on my blog. Regarding Nirupama’s comment i think she wanted to say terrific and instead wrote terrible because she has thanked u for making her cooking easy and interesting. Keep up the good work. This is a very nice recipe. Looks so good. Nice colorful recipe. YUM! Shilpa, its very good recipe….will try it soon…. i have a question though…. abt simple egg cake… i asked it in comment of that recipe too guess u didn’t see it… anyway when i bake a cake (any cake) its gets little more brown and kind a crispy on the edges can u please tell me what is the reason coz i am planning to bake that simple egg cake again….waiting for ur reply…. Shilpa: Nusrat, I am not very sure, but I think the temperature must be set wrong. Next time, try keeping it at a lower temperature (say about 50F less than what you kept this time). Bake it in middle rack of oven instead of top(to avoid direct high heat at the top). I think these two should help. I am a frequent visitor to your blog. But this is the first time I am leaving a comment. Tried it out this afternoon for a quick lunch. Extremly yummy and filling recipie. I substitued moongdal with masoor dal. Such a great comfort food for a cold and rainy winter afternoon here in california. Definitely a keeper, since my kids loved it too. Keep them coming ……. Shilpa: I have made it with both basmati and sona masuri, both taste great. Thank you for this and all the recipes. It looks Yummy .. I am feeling like having it right now.. This one is really simple and wholesome recipe..perfect for a wintery day…. Shilpa, can this pongal be made in non – indian rice (US long grain) too? I love your blog, thanks for the awesome work and helping new cooks like me. oh please.. I believe Nirupama did not mean it was terrible, why would she thank Shilpa so much and tell that her cooking sessions are made easy and interesting? Which one sounds more sensible as a sentence? I believe Shilpa understood this possibility and didnt say anything else other than asking what went wrong, inspite of it being her blog. and, here comes Ms.Anjali (however close she may be to Shilpa) talking about others’ audacity.. what an audacity!! Pls do not pass on comments in haste, whether it be someone’s character or caste. P.S: Nirupama, you seriously need to read your comments once, before you say “publish”. I have one more request for you if possible (i.e. other than having recipe’s listed in alphabetical order). Is it possible to have a list of all recipe’s that take only 30 mins or lesser preparation time. Personally I am a working person, and have no help in the kitchen. So simple, quick n easy recipe’s are more useful to me. Just a suggestion though :). I like ur site so much. I am trying out the rasam and ragi idli this weekend!! Bon appetit! I am going to try it today. Oh yes, this will definitely bring comfort on a cold day! Ms. Hema I tried to read it like that too. So you think it Ok to type in terrible and mention a reference to caste eh! Scoot off. BTW I am not close to Shilpa yet I know what she has been going thru for a while now as a blogger. I reacted as I understand what pains a blogger takes to maintain one. She has been saying it so many times here itself have you not read it. She needs to be encouraged to keep doing the good work don’t you think? Are you a regular? Do you blog? Let Nirupama resolve it why are you writting on her behalf if you feel what I did was wrong on behalf of Shilpa and her blog. I appologise to all other readers for having to witness this. I made pongal yesterday and it was wonderful ! can you tell me how long I need to keep the pressure cooker on the fire, how many whistles, etc? I have never cooked rice in a pressure cooker, always resort to draining method. It is really good receipe and i will try this and make my family surprise.bye.thanku you for this receipe. shipa, i thank all the readers who immediately made me realise my mistake and my sincere apologies to ANJALI for making me understand where i should restrict myself. Also thanks a lot HEMA for finding it out that what i meant was terrific. thanks a lot readers and my dear friend shilpa. Happy and a Prosperous New year too ! I tried your vegetable pongal recipe today. It tasted superb. Thanks so much for such an easy and healthy recipe. I intend to try lots of recipes from your website. Thanks again. wonderful recipe, never thought of adding veggies to pongal. Will try it and Iam sure it will be great.